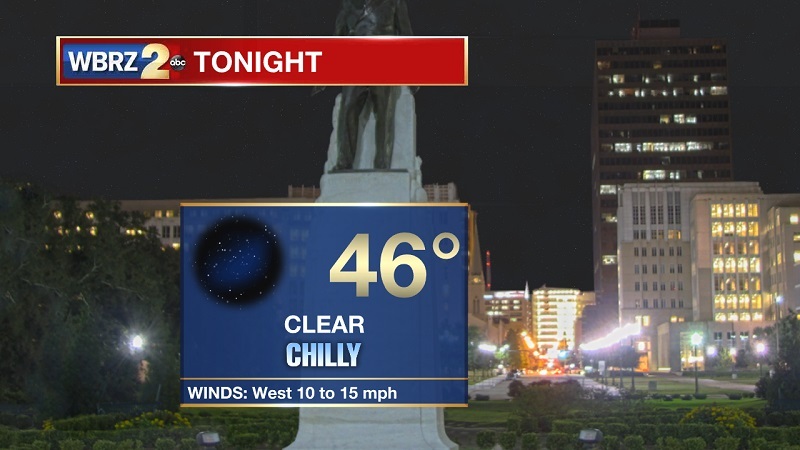 Tonight and Tomorrow: Clear skies and calming winds will help to bring chilly temperatures across the area into Monday morning. Overnight lows are set to drop near 46°, but warming will begin on Monday. Temperatures will be near 77° with light winds out of the south. Up Next: A dry spell through the beginning of the workweek, but showers and strong storms will be returning late Wednesday and through the day on Thursday. Sunny skies and dry conditions come back in on Friday, and will finally be staying through the weekend. High pressure has moved in from the west, but will travel west to east along the I-10 corridor late Monday and early Tuesday. This keeps winds low and temperatures mild. 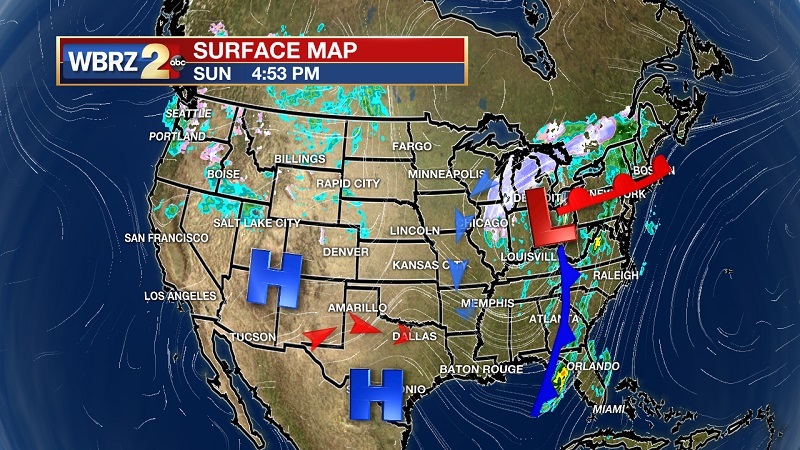 As the high begins to retreat toward the east, southerly winds will allow for temperatures to break into the above average range and into the low 80s on Wednesday. An approaching frontal system will also help to bump up temperatures and dewpoints before strong to severe storms press into the region from the northwest on Thursday. We are already in the Storm Prediction Center’s 15% chance for severe weather category 4 and 5 days out, so there is a good chance that severe weather will be accompanying this system. The front pushes southeast and into the Gulf late Thursday, as a relatively strong high pressure takes its place on Friday. Cold air will also sit in, keeping highs in the low-to-mid 70s into Saturday. The high stays put through Sunday, allowing for widespread sunshine with no threat of rain over the weekend.